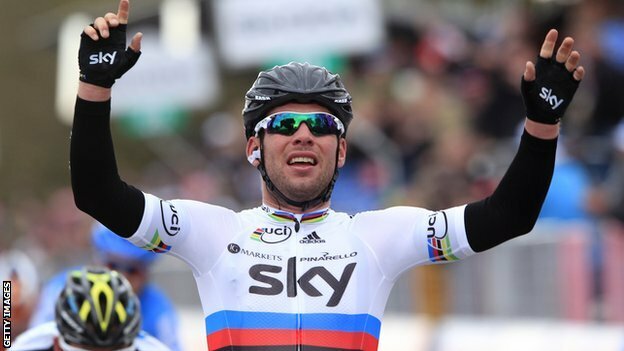 World road race champion Mark Cavendish won the fifth stage of the Giro d’Italia in Fano. Team Sky delivered the Briton expertly in the sprint as he claimed his second stage victory of the race. He had the perfect run-in with 500m to go, beating Australian Matt Goss and Italian Daniele Bennati into second and third place. Cavendish is in fifth position overall, with Ramunas Navardauskas still leading. The Lithuanian is five seconds ahead of Garmin team-mate Robbie Hunter, with Cavendish 14 seconds off the lead in fifth and colleague Geraint Thomas a further two seconds adrift in sixth. Cavendish attacked late in the 209km stage from Modena to claim his 32nd stage win in a major tour – and ninth in the Giro – just three days after he crashed during the sprint finish to the third stage. “I didn’t feel great, I haven’t slept properly since [crashing on] Monday,” Cavendish said, “but I still have a job to do. “We were able to commit all our guys at the end and we took the race up with 10km to go and it was textbook work from the team. However, Cavendish conceded that his chances of wearing the race leaders’ pink jersey, or winning the red points jersey were gone. “I lost out on 20 points because of the crash on [Monday’s] stage to Horsens and so it’s gone,” he said. “I’m disappointed but I’ll come back and try to get it next year. Goss added: “Right now Cavendish is impossible to beat. The sixth stage takes the riders 210km from Urbino to Porto Sant’Elpidio, with four medium-category climbs, while the Giro ends in Milan on 27 May. This entry was posted in Biking and tagged Giro. Bookmark the permalink.